Sri Lanka, only forty-five miles from the southern tip of India, has had a thriving Buddhist culture for more than 2,000 years. According to tradition, the religion was introduced in the mid-third century B.C.E. by missionaries sent by Ashoka (reigned ca. 272 – 231 B.C.E. ), India's first great Buddhist king. The missionaries were led by Mahinda, who was possibly the son or brother of Ashoka. Sri Lanka's king, Devanampiyatissa, converted to Buddhism and the country's earliest monastic complex, the Mahavihara at Anuradhapura, was founded circa 236 B.C.E.. Around this time, a cutting from the bodhi tree under which Shakyamuni Buddha achieved enlightenment was brought from India to Sri Lanka by a nun named Sanghamitta and planted at the Mahavihara; the tree (or its descendent) still flourishes and is the most popular pilgrimage objective in Sri Lanka. Worship of the bodhi tree subsequently became an important part of Sri Lankan worship, and a bodhi tree shrine was established in every monastery. Each consists of seated images of the Buddha placed around the tree facing the four cardinal directions. 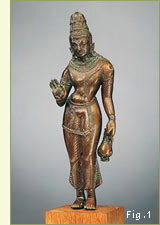 Unlike Indian representations of the Buddha seated under the bodhi tree, in Sri Lankan images, the Buddha holds his hands in the gesture of meditation (dhyana mudra) instead of in the earth-touching gesture (bhumisparsha mudra) that Shakyamuni used to call the earth to witness his right to achieve enlightenment. Anuradhapura, Sri Lanka's capital from circa 500 B.C.E. to 993 C.E., became the center of the country's Buddhist culture and home to the three main monastic complexes: the Mahavihara, the Abhayagiri, and the Jetavana. Virtually all other Sri Lankan monasteries owed ecclesiastical allegiance to one of these three institutions, whose relative importance in any given period was determined by patronage from members of the ruling dynasty. Both Theravada Buddhism and Mahayana Buddhism were practiced in Sri Lanka. Like southern India, the island was long a port-of-call for those who traveled along the international shipping lanes that crisscrossed the Bay of Bengal. 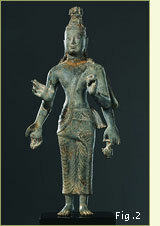 The complex interrelationship between Sri Lankan and Southeast Asian sculpture produced by the transmission of Buddhist thought and imagery along the trade routes is illustrated by the provenance of a small standing Avalokiteshvara, the Bodhisattva of Compassion (Fig. 1). This delicate sculpture, reportedly found in southern Thailand, has been assigned a Sri Lankan origin, although some scholars have proposed Thailand, Vietnam, or Cambodia as its place of creation. The stylistic links that have caused so many scholars to disagree over the provenance of this piece suggest the important, yet under-researched, role Sri Lanka played in the diffusion of Buddhist art styles in Southeast Asia. The practice of Mahayana Buddhism in Sri Lanka is also evidenced by a four-armed image of the Bodhisattva Maitreya, the Buddha of the Future (Fig.2). Although Mahayana Buddhism was quite popular in Sri Lanka, especially from 300 C.E. to 993 C.E., it was the conservative Theravada Buddhist tradition that made the country so influential in Buddhist Southeast Asia. Theravada ("School of the Elders") can be thought of as a type that, as Buddhism grew and expanded, continually inclined toward the conservative. Sri Lankan monks rejected change and sought to preserve the so-called original doctrine of the Buddha. As a result, Sri Lankan Theravada was completely codified by the fifth century C.E. Theravada Buddhism offered an alternative to the Mahayana and Vajrayana Buddhism practiced in northern India and the Himalayas, and some Southeast Asian kings, particularly those in Burma (Myanmar) and Thailand, saw it as more "pure" than other types of Buddhism. Sri Lankan Buddhism ultimately became highly influential in those two countries, affecting not only religious practice but statecraft and artistic expression.